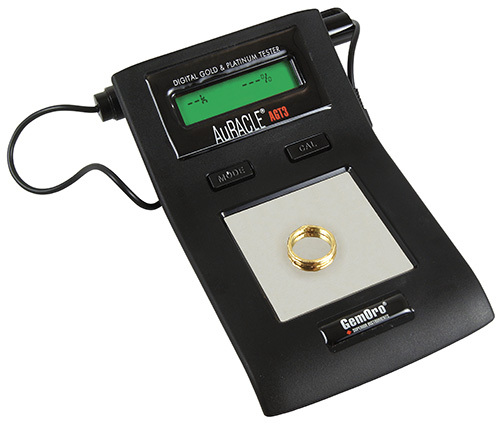 The new advanced digital AGT3 is the ultimate verification instrument for gold and platinum testing. This state-of-the- art portable handheld tester has exceptional precision, is simple to use and in seconds provides accurate results showing both the digital karat value and gold percentage – PATENTED WITH PATENTS PENDING. See related products below for Replacement Pen (817-1048). Tests all colors of gold from 6K to 24K and tests platinum. Alphanumeric LCD display shows both karat value and gold percentage. Easy one-step calibration using either 14K or 18K yellow gold. Durable nickel-plated stainless steel testing plate. Sleek, contoured and ergonomic design. Follow easy steps to identify non-gold, gold plate and gold filled as NA. Simply touch pen probe to filed gold or platinum and results are shown in seconds. Replaceable pen probe provides thousands of tests with proper care. Powered by included 9V alkaline battery or 100V-240V AC adaptor. INCLUDES: AGT3, pen probe, file, battery, AC adaptor and rubberized carrying case.